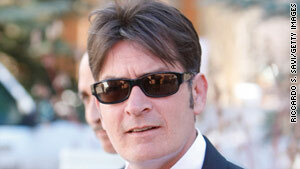 Charlie Sheen would spend the next month as a jail inmate and a theater intern if his plea agreement is accepted. (CNN) -- Charlie Sheen will stand before a judge Monday afternoon to plead guilty to charges stemming from a Christmas morning argument with his wife in Aspen, Colorado, a prosecutor said. If the judge accepts the plea agreement, the television star would spend the next month as a theater intern by day and a jail inmate at night. Pitkin County, Colorado, District Attorney Arnold Mordkin would not confirm reports that Sheen would serve 30 days in jail, but the sheriff has already scheduled a news conference to answer questions about his jail. The proposal includes a month of community service for Sheen, 44, working with Theater Aspen, according to Paige Price, the theater's artistic director. "We've often been in a position of helping people fulfill their community service, but he would be our highest profile intern," Price said. Sheen's duties with the community theater haven't been outlined, but it would involve "some utilization of his skills as an actor," Price said. Sheen, who began acting professionally in 1974, may teach master classes for professional actors working during Theater Aspen's summer productions, Price said. The summer plays include "The True Story of the 3 Little Pigs!" -- billed as "a clever musical which follows the fate of the Big Bad Wolf." "There's no part in that for him," Price said. Sheen's legal trouble began last Christmas morning when his wife, Brooke Mueller, called police to their holiday home. "My husband had me with a knife, and I'm scared for my life, and he threatened me," Mueller, 32, told a police dispatcher. The police report quoted Mueller saying Sheen held a switchblade knife to her throat as he held her down on her bed. "You better be in fear," the report alleged Sheen told his wife. "If you tell anybody, I'll kill you. Your mother's money means nothing. I have ex-police I can hire who know how to get the job done, and they won't leave any trace." An Aspen police officer wrote that he saw "red marks on the upper part of the front of her neck." Sheen denied attacking his wife, but admitted breaking her glasses, the police report said. The argument began when Mueller became jealous that Sheen "shared a song for his daughter, whom he fathered with another woman," the officer quoted Sheen as saying. Sheen told police he became angry when his wife threatened to divorce him and fight for custody of their twin sons, the report said. Aspen police charged Sheen with felony second-degree assault, felony menacing and a misdemeanor charge of criminal mischief. He was booked under his birth name, Carlos Irwin Estevez. Both Sheen and Mueller, 32, entered substance abuse rehab several weeks after the incident. The couple was married in 2008. Their twin sons, Max and Bob, celebrated their first birthday in March. The son of actor Martin Sheen, Charlie Sheen currently stars in the hit CBS sitcom "Two and a Half Men." He recently signed a new contract to continue with the series. CNN's Jack Hannah contributed to this report.